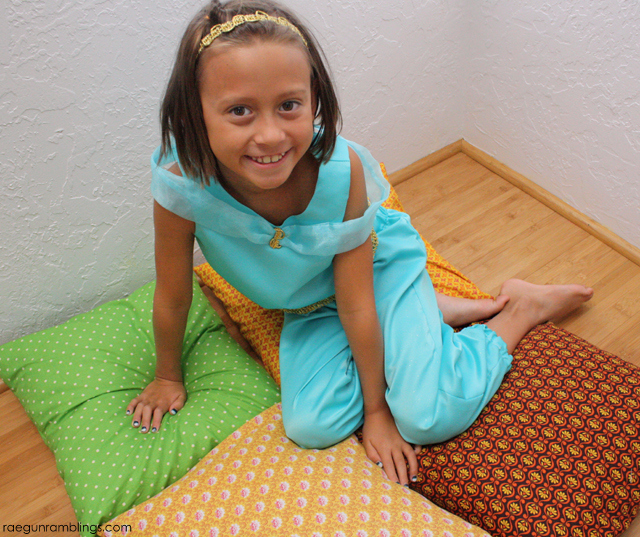 I’ve said it before but Princesses dresses are probably may favorite thing to sew ever. 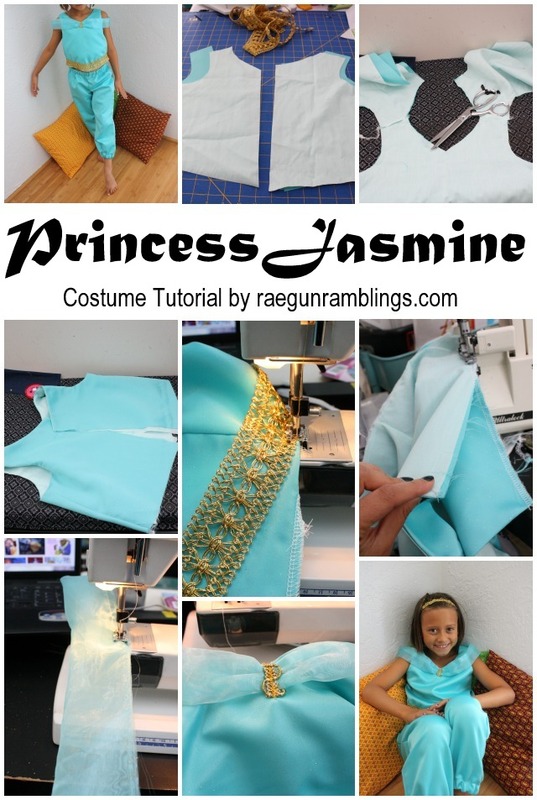 But what about those silly princesses that wear pants, well I guess they are pretty fun to make too ;) To day I’ve got a DIY Princess Jasmine Costume Tutorial to share with you guys. 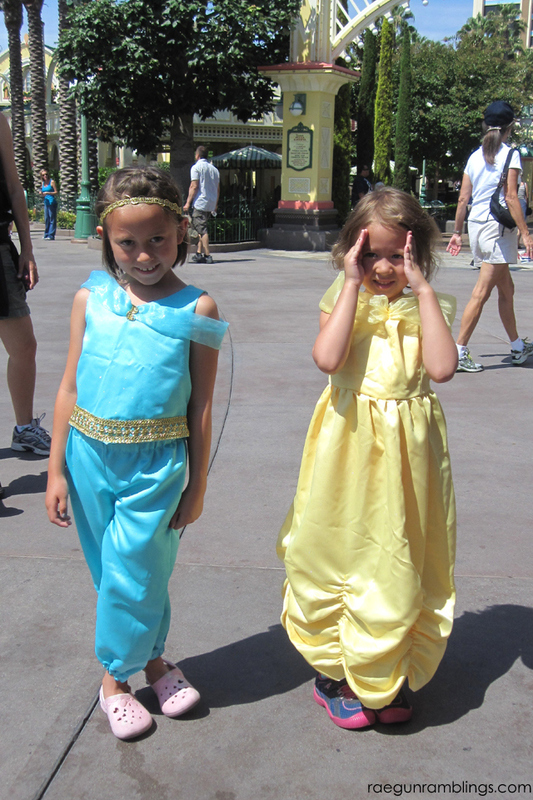 Last year when the whole family went to Disneyland I made the nieces each two princess outfits. 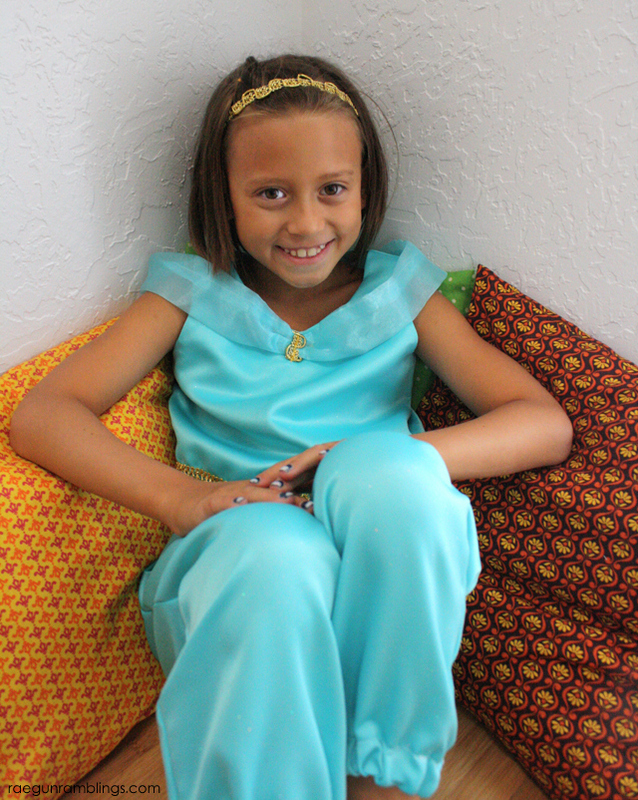 And T picked Princess Jasmine from Aladdin for one of her costumes. I really love how it turned out and it was relatively easy to make if you just use some patterns or ready to wear clothes as your guide. Make your pattern by folding your shirt in half at the center front trace around giving yourself a half inch seam allowance. Repeat for the back. Cut out a front bodice piece and back 2 bodice pieces out of the shinny fabric and the lining. The front piece should be cut on the fold. With right sides together sew the bodice shinny pieces together at the shoulders. Repeat for the lining. With right sides together sew the shinny fabric to the lining around the neck and armholes. Sew the side seams by opening up the pieces and placing them right sides together and sewing down the line. You should have a basic top with the back open. Finish the bottom edge of the shirt so it doesn’t unravel either with a zig zag stitch or serger. Sew on your wide trim to the bottom of the shirt with a zig zag or 3 step zig zag stitch. Sew the back together leaving about 6 inches open at the top. Cut your sheer fabric 5 inches by the length of the fabric. Fold in half lengthwise and sew so it’s a long strap. Turn right side out. Pin in place on your bodice and cut any excess off. you want it to fit loosely around. 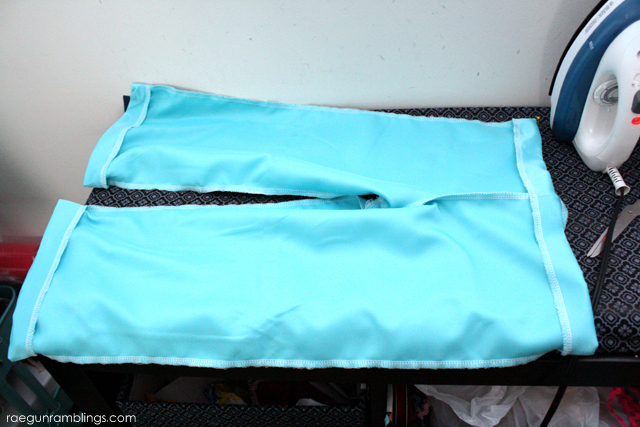 Sew a small piece of gold trim to hold the “sleeve” pieces to the center front of the boddice. Fold the left side of the back piece under 1/2 an inch and sew. Top with buttonholes. Fold the right side under and sew. Top with buttons. This is how the back looks. Sorry I didn’t get any pictures about how to close up the back. 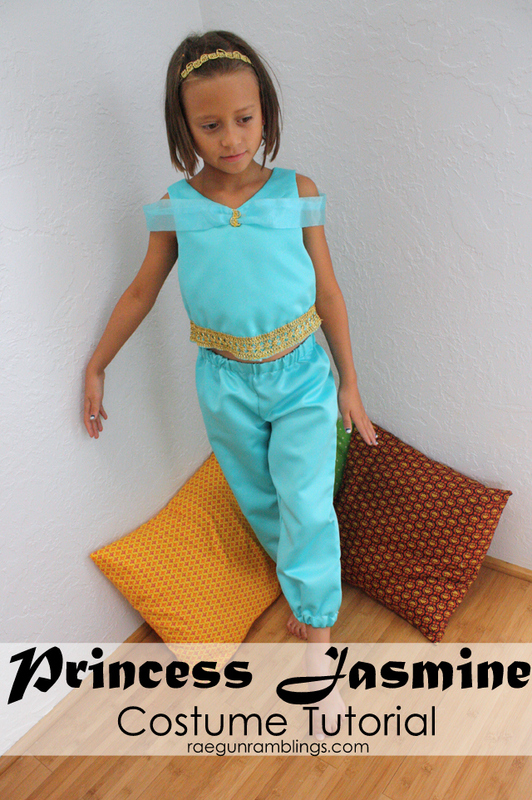 To make the pants just get a basic pajama pant pattern and sew it as directed but when it comes to hemming them make a wide hem and add in some elastic to make the genie style pant look. And because I cannot believe how big a difference just one year makes here’s the costume on T while we were at Disneyland. Obviously it’s a lot shorter now! Stay tuned. I’ll be sharing how I made the Belle dress soon!